Kaua`i House Of Prayer: Established by a broad based fellowship of churches across the island of Kaua`i, our desire at KHOP is to exalt and proclaim the Lordship of Jesus Christ, to provide a place (both physical and in our hearts) in which He would desire to dwell 24 hours a day, 365 days a year. We believe that God "inhabits the praises of His people" (Psalm 22:3) and are committed to seeing His praises proclaimed creatively and continuously. Welcome to the Kaua`i House Of Prayer website! Mahalo (Thank You) for your interest in Kaua`i House Of Prayer. I was thinking that it’s probably time for me to start working on a newsletter. Since we’ve moved down here (Tototlan, Jalisco, Mexico) we’ve spent most of our communication time on Facebook (FB) as more and more people are adding themselves to that social network and, quite frankly, it is the primary mode of communication that we have with most family and friends, in addition to reconnecting with old school or long-lost friends... I have found it to be absolutely delightful. However, I am also aware that there are just as many of our family and friends who are not engaged in the social media world and prefer email... which is fine, too. We’ve been living in Tototlan for over 1½ years now, and it has been quite an adventure for us... and at times very challenging. We believe this is God’s plan for us right now so we’re in it for however long HE so desires. When we first arrived, our first major project was to get our living quarters in order. We are living on my sister and brother-in-law’s property. There are two (2) houses on the property... the main house in front and a smaller one in back which is where we live. An uncle, Don Lupe, (who passed away 9 months ago) owns the property on both sides... one side is his home and the other side is a gated parking area which includes a huge (dirt) yard and a covered barn-like garage. The homes here are made in concrete, brick or stucco and many roofs are aluminum. No wood used. Floors and countertops are either cement or tile. There are still many homes here with dirt floors. My nephew & his wife (Chato & Chata) lived in the back house for 9 nine years after they were married. When my sister became ill they moved into the front house to help care for her and continue to live there since her passing over 3 years ago. This back house had been empty for quite some time, and was in much need of help. We painted the inside and out, repaired the windows (many were broken or cracked), bought new appliances (old ones literally fell apart when we moved them), and bought furniture. We’ve really tried to make this our home with whatever personal touches we think up. Asbestos is widely used and many homes, including ours, still has it. Our kitchen and bedroom have asbestos roofs. Hopefully one day we can change that, but for now we just pray for God’s protection. I have done so much gardening. If you’d seen the yard when we first arrived and compared it to what it looks like today... night and day. The part of the yard that I worked on is not part of this property. Before his passing, Don Lupe gave me permission to do what I wanted so I began to weed and plant and now it looks pretty nice. Still would like to do more. I have lots of flowers in planters also and most of them are on the front part of my house along with a nice patio table & chairs. Here are the before and today photos. About 3 months after arriving we began having Tuesday Night Get-Togethers... “Martes Social”. We have dinner together, pray and sometimes sing. It is so hard sometimes to get everyone on the same page as the culture does not lend itself to “fellowship” sort of gatherings where talking about God is paramount. We don’t want to be “churchy” but relationship-oriented, and though we have some great relationships with some people, it has been difficult moving out of the social and into the spiritual realm. Our paradigms have undergone and continue to undergo makeovers. “We know nothing as we ought to know.” Religiosity has a major stronghold here. People have tons of statues of various saints in their homes and most pictures of Jesus are of Him dying on the cross... nothing of resurrection or salvation. We are waiting on God to show us where He wants us to go with these get-togethers and until He does we will continue to have them. It’s not a big group but we enjoy the evenings. I know we have made some difference, but we are so wanting to see more... people saved, healings, wonders and miracles. Please pray for us... we need patience to wait upon God and His timing. We have come to be known as “Los Tios” (uncle & aunty) here in Tototlan. Just when we wonder what we’re doing here, God sends someone who encourages us and let’s us know that we are making a difference just being here. We visited Tototlan several times before moving down here, and during those times we had the opportunity to pray for many people. Each time prior to our return to the U.S. my sister would always get her family together so we could pray for them, as well as, praying for other relatives. We saw people healed and other displays of God’s presence. So when we first moved here we immediately had several opportunities to pray for people. Our first occasion came when the only child, José (21 yrs old), of our neighbor across the street was in a motorcycle accident and was not expected to survive. His mother is in a wheelchair and has diabetes along with heart problems. Needless to say, she was hysterical (literally wailing in the street) upon hearing of her son’s accident. We had the opportunity to pray for her and give her money to travel to Guadalajara (about an hour away) to be with him at the hospital. Because of his grave condition and her medical issues, they did not allow her to see him. At the accident site, several people said they thought he was already dead... major head injury. Jose’s co-worker, who drove her to Guadalajara, was able to see him, and the results from the head trauma did not look promising. Later that day he seemed to just come out of everything and was home the next day... now THAT was a miracle. Other God-moments happened as we walked through the various booths during the 2010 fiestas when we met several ex-cons who had been deported back to Mexico, and we were able to pray for many of them while some of their friends stood by ridiculing them as they were all drunk. God is constantly giving opportunities to pray for people, and we (all of us) just need to make ourselves available for His use and aware of His leading. This year’s fiesta was in May, and a dear friend, Frank Bejo from Kaua`i, joined us. He is a very gifted man who paints to worship music. Unsurprisingly, his method of painting (sometimes up-side-down) drew amazing responses from the audiences. God arranged for Frank to have his painting exhibitions at the “Presidencia”, which is where presidente municipal Ossiel Niaves Lopez (Mayor) of Tototlan has his offices. The presidente was very impressed and invited Frank to paint at a big luncheon the pueblo gives to welcome visitors to the fiestas. Later we presented him with one of Frank’s small paintings which now hangs in his office. He has extended an invitation for Frank to return again for the 2012 fiestas. Please pray that Frank can make it again next year (and hopefully bring his lovely wife, Gale, with him). Since we are here in Mexico on a Visitor visa, we have to return to the U.S. every six (6) months. I’m thinking about getting a dual citizenship visa. Since my dad was born in Mexico, I can do that. I just have to find out all the particulars on how to do it. Having a dual citizenship will allow me to stay however long I want without having to return to the U.S. so often (saving us money), as well as, I could legally work here and even buy property. Having it will not affect my U.S. citizenship. However, Kerry will still have to return every six (6) months. 2011 proved to be a year of terrible violence in Mexico. Tototlan had more than its share. The drug cartels are massacring people left and right. They are mostly fighting each other for territorial rights. In this small pueblo we’ve had a good dozen killed and some nasty shootouts. We’re careful about our comings and goings and don’t put ourselves in any danger to get caught in any crossfire, but we also know that God has us covered. We usually don’t go anywhere at night and stay away from questionable areas. There have only been a couple of shootings since October... thank you, Lord. This year we’ve met some neat young people and have been building relationships with them. In September we were invited to share our testimony with the church youth group. I took my guitar and played some songs and Kerry gave (I interpreted) his testimony. We were expecting around 15 or so... at least that’s what we were told. However, when we got there, the group totaled about 50 kids ranging in the age group 12 – 15. They really seemed interested and enjoyed our presentation. We also had the opportunity to donate to them one of the paintings Frank did during the fiestas. They were so excited about it and invited us back to share again. We just have to find a mutual date. 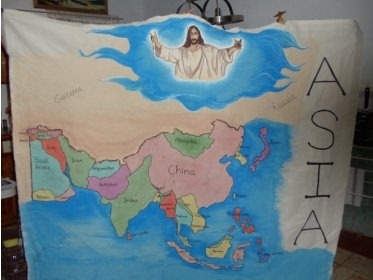 We were also asked to help them make a banner for the “Praying for the Nations” event. Our group’s focus was Asia. The event was held in the soccer “stadium” and was attended by over 500 youth plus parents and relatives. After they prayed for the continent they released hundreds of balloons. It was quite a sight. Here is the banner that Chato & I did. Chato drew Jesus and I did the countries. Then in November, Tototlan hosted the “Marcha Juvenil” (Youth March) where over 4000 youth ranging in ages from 12 to 20 years from all over Jalisco and other states came and met in the park and sang and did skits then walked to the templo on the hill “Templo Santo Sabas”. Templo Santo Sabas is located about 3 miles from downtown and the last half-mile is all uphill. For the youth this is not as challenging, but for Kerry & I it is not quite as easy. Fortunately just as we stopped to rest before heading uphill a friend came by in her SUV and offered us a ride to the top. Halleluiah!!! We spent the day at the templo and enjoyed the kids singing, dancing and just having fun. Kerry is playing basketball on Saturday mornings and is getting to meet some kids and help coach them. He really enjoys it. Who knows, this could be the beginning of another opportunity to bring Jesus to these kids. We had a “posada” (Christmas office party) for Don Agustin’s staff (Chato works for his uncle) on the property. We cleaned out the garage and decorated it and hung up a piñata. It was really nice. We had about 50 people which included the relatives. Our Christmas and New Years was nice. On Christmas eve we had a small turkey dinner with Chato & Chata and Don Lupe’s widow and daughters. Again, we fixed up the garage and enjoyed an intimate family evening. (Christmas eve is the day most people celebrate here... not Christmas Day.) On Christmas Day, we packed a nice turkey sandwich lunch and drove out to Chapala for the day. We ate by the lake and toured the town. It was really nice and sunny... very Kaua`i-ish weather. Our New Year’s was quite the opposite. We did not partake in any celebration as we turned in early and good thing we did. A Mexican custom (which we’re not too fond of) is shooting guns to celebrate. People just shoot guns (lots of rounds) into the air ...and as you know, what goes up... must come down. So turning in early is a nice safe thing to do. There sure were a lot of shots this year, too. Well, this pretty much capsulated 2011 for us here in Mexico. We are asking the Lord for more opportunities to do more stuff. I’ve been asked to teach an English class and hopefully I can do that soon... organizing it is the challenge as everyone who is interested has their hours and the age groups vary drastically. We’ve had our challenges... wondering what God has in mind, direction, finances, health... but nothing that God can’t handle. Sometimes we get a bit short of patience... we want to know and understand everything God has for us which almost always He does not do according to our timing. So we have had to exercise must faith and trust in moving ahead in what God has for us. Challenging indeed. Nonetheless, we hold on to His word to us and His leading... wherever that may take us. We pray that 2012 will be a year of great victories and advances in our work here for the Lord. For you, dear friends, we pray for new beginnings... more mountaintop experiences... deeper and more meaningful relationships with Him and with each other... renewed commitments to the things of God... greater growth in the knowledge of His goodness... more fruitful journeys for Him... spiritual, material, financial and physical blessings and rewards be multiplied to you. May you seek your “Utmost for His Highest”. 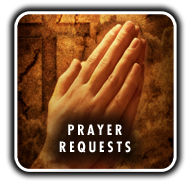 We covet your prayers for direction, physical health, more opportunities to proclaim the Gospel of Jesus Christ, finances and protection. We invite anyone who would like to come visit us. During the fiestas is always a good time because the opportunities to share the gospel are endless, as well as, enjoying the cultural festivities. This year the fiestas begin on May 9 to 20. Please email us for more info if you so desire.